Contractor Brands with Ford Transit Connect Vehicle Graphics! Branding with contractor vehicle graphics is an excellent means of using your company vehicle. Why drive a bland automobile when you can wow consumers with an attractive look? Case in point is PathoSans. Located in Wheaton, the company is in the business of providing a system that allows for the sanitation of products within the educational correctional, health care and food processing environments. 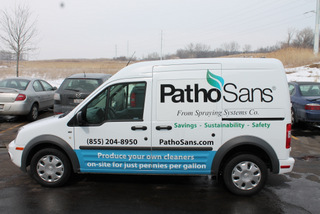 In fact, PathoSans allows facility managers to convert softened tap water and salt into powerful cleaners on site. To visit the consumer, the company has purchased a Ford Transit that provides ample room for the business’ representative as well as the products that require transportation. 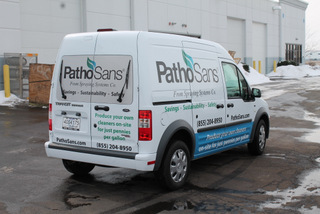 When it came time to add Ford Transit Connect vehicle graphics, PathoSans contacted Mark Your Space. We used the white color of the van as the backdrop for the company’s name. Adding information about the company’s products and niche, there is also a display of contact options. This same information is also available on the back of the vehicle in condensed form. Adding a window perf, we used the rear windows of the vehicle for additional marketing message space. The resulting look turns a standard delivery vehicle into an informative billboard that gives the consumer must-have facts about the business. 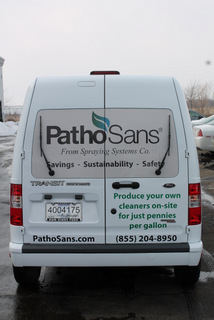 As PathoSans builds name recognition, it brands the business and highlights the availability of a product line that some facility managers may have been unaware of. What could the right vehicle graphics setup accomplish for your company? Differentiate yourself from other service providers. Whether you run a sanitation system business or a landscaping firm, the need to stand out from the competition is universal. Too many times, professionals invest in building signage and purchase expensive direct marketing campaigns without considering that they already own an unused billboard space: the vehicle. Stand out from the crowd of service providers by being the one that shows up in an automobile with attractive marketing graphics. Increase name recognition. As you drive through the areas where you do business, consumers see your vehicle. Over the course of the week or month, this practice will likely lead to repeated exposures for some. Seeing your vehicle frequently enhances your name recognition. To some, you may have become such a fixture in the area that they consider you the neighborhood contractor for this particular service, which will then influence their buying decision when considering this service for their own needs. Highlight available services. If you run a landscaping business, it is clear that you provide the standard mowing and edging. So, why not stand out from the competition by placing graphics on your truck that identify additional services you offer. For example, you may offer seasonal re-seeding, tree pruning and lawn aeration. If you run a painting company, you may add pool painting or façade repairs to your menu of services. No matter what type of service you offer to the consumer, ensure that you include boutique treatments that may be different from those offered by the competition. Talk to our experienced vehicle graphics experts for more information. We gladly discuss the use of a wide variety of decals, graphics and related products such as the use of a window perf or roof graphics.